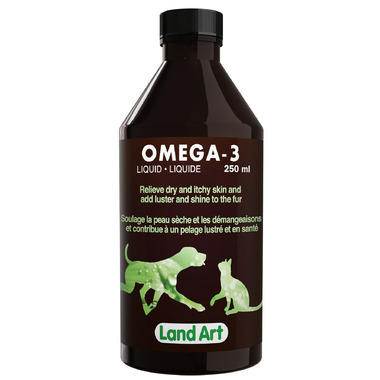 Ideal for cats and dogs, Land Art’s OMEGA-3 is made with natural cold pressed (not denatured) grade fish oil. Fish oil OMEGA-3s are easier to digest and assimilate by cats and dogs than vegetal sources. Fish oils will not only help with allergies and skin problems like atopic dermatitis and rashes, they are also recommended for other conditions. They can improve the coat, help with kidney and heart problems, reduce different forms of inflammation and even improve the learning capabilities of young dogs. Intensive treatment: One dose per day, everyday for 1 months. Preventive treatment: One dose per day, 3 times a week for 6 months or as needed. For seasonal allergies: Give 2 to 3 months at spring and autumn.